Anyone can get Scabies. Scabies is a skin condition caused by an infestation of the human itch mite called Sarcoptes scabiei. These microscopic mites burrow into the skin and cause symptoms of itching and rash.It is found all over the world and the mite is transmitted by direct and prolonged skin-to-skin contact with a person who has scabies. Sexual contact is the most common way scabies is transmitted. Transmission can also happen from parents to children, particularly mother-to-infant. The mite can only survive about 48 to 72 hours without human contact, so it is uncommon, though possible, for scabies to spread through infested bedding or furniture. Animals do not spread the same types of mites that cause human scabies, so it is not possible to catch scabies from a dog or cat. The type of scabies that can infest pets is called "mange." To get to know everything about scabies such as "What is Scabies ? It's Symptoms and Prevention" then you can read the whole article, in this article we provide all the details regarding scabies.. Symptoms of Scabies : There are some symptoms of scabies you can read the symptoms of scabies. The onset of symptoms of scabies varies depending on whether or not a person has previously been exposed to mites. The first time a person is exposed to the scabies mite, it can take upwards of 2-6 weeks for symptoms to develop. This time frame is significantly shorter in subsequent infestations as the body's immune system is quicker to react (typically in 1-4 days). Some points of symptoms of scabies are given below..
Itching - itching is one of the symptoms of scabies, this is often worse at night and can be severe and intense. Itching is one of the most common scabies symptoms. Rash - when the mite burrows into the skin, it forms burrow tracks, or lines, which are most commonly found in skin folds, and resemble hives, bites, knots, pimples, or patches of scaly skin. Blisters may also be present. Sores - these occur in infested areas where a person has scratched at the skin. Open sores can lead to impetigo, commonly caused by secondary infection with Staphylococcus aureus. Thick crusts - crusted scabies, also known as Norwegian scabies, is a form of severe scabies in which hundreds to thousands of mites and mite eggs are harbored within skin crusts, causing severe skin symptoms. Tests and Diagnosis of Scabies : Scabies can sometimes be mistaken for dermatitis or eczema as these skin conditions also cause itching and bumps on the skin. Anyone who is unsure about the cause of a skin condition should consult their physician as OTC remedies cannot eradicate scabies. A doctor can diagnose scabies by examining the skin or by looking at skin scrapings under a microscope. If you have any doubt that you may have scabies, then without wasting the time contact the doctor. Treatment for Scabies : Treatment with prescribed medications will generally kill mites quickly. 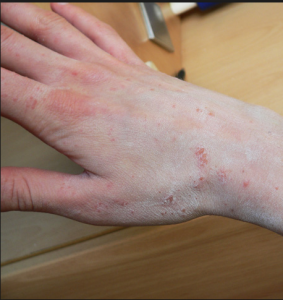 The itching and rash may initially become worse; however, skin healing should be seen by 4 weeks after treatment. Some people require more than one course of treatment to fully rid themselves of mites.